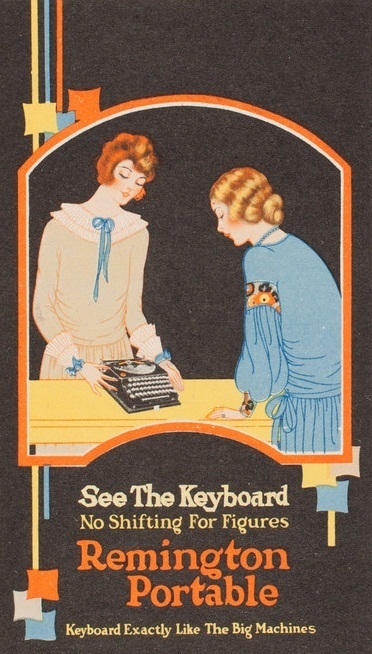 Events in 1919 flattered to deceive the portable typewriter marketplace of 1920. On December 10, 1919, The Wall Street Journal said Remington had started making its “unusually good model” and would “put it out in the next few weeks”. At that point Remington directors and stockholders were no doubt rubbing their hands in glee. With Underwood finding it couldn’t produce enough typewriters to meet early demand at its Hartford, Connecticut, plant, Remington seemed certain to steal a march on its major rival – and to be the first of the major manufacturers to truly challenge Corona’s stranglehold on the portable market. In the event, the champagne stayed on ice at 374 Broadway a very long time. Just as Underwood had been forced to do in August 1920, in moving portables production to another plant, Remington moved the manufacturing of its portables to one of its former Union Trust stable factories – the Smith Premier plant in Syracuse, where production of the Smith Premier standard was discontinued to allow for the making of the new portable (a Monarch standard continued to be made). It wasn’t until September 27 that the Journal was able to report the 7½lb Remington portable (“with all the features of the standard Remington’) was “now in quantity production”. The machine was due on the market in 60 days (that is, November). Topics’ coverage of the show pointed out, however, that not far from the Remington fuss was another one surrounding yet another portable. This was the Gourland – the difference being the directors of the Gourland Typewriter Corporation had something already well and truly on the market to show for their efforts. “Gourland luminaries were having the time of their lives,” wrote Topics editor Ernest Merton Best. And well might they. 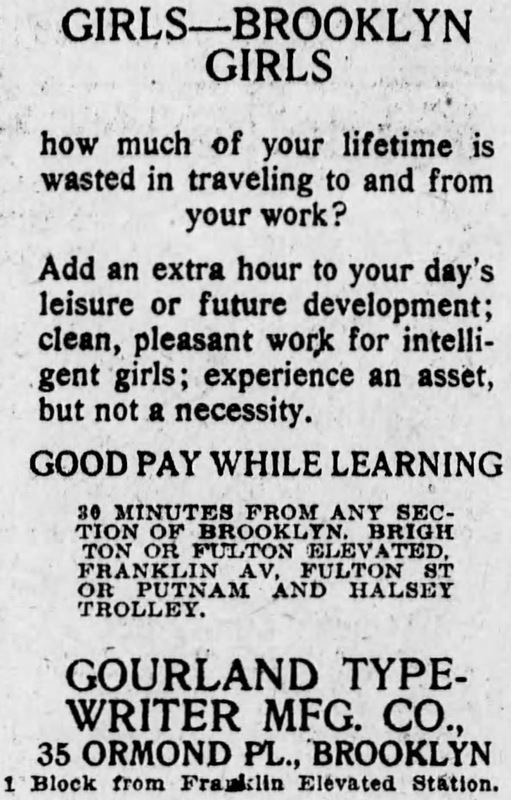 They were “listening to the unusual compliments passed about regarding their product.” One of the Gourland team was Walter Wilbur Ramer, head of the Typewriter Factory Sales Corporation and previously of the Wholesale Typewriter Company, Montclair. Another “luminary” at the show was Neal D. Becker, president of Hammond. While Hammond in 1920 continued to strenuously push its 11lb “lightweight” version as a portable, guess what Becker took when he went to Europe: a National portable! Typewriter Topics got to review the Remington portable for its November issue, saying its “advent has been long expected by the typewriter trade.” In terms of full market flow, in the end there was really only a few weeks between the arrival of the Underwood and the Remington portables, making the advent of a four-bank portable an even more crippling blow for Underwood’s huge hopes for its machine - and after five years of planning to boot! What should have been a full year start for Underwood turned out to be just a matter of a month or so. 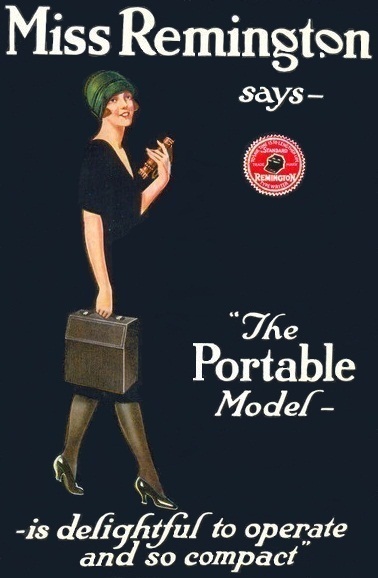 Admittedly, Remington portable production didn’t hit its straps until 1921. Topics added, “The great and growing demand for a small, compact, practical, portable writing machine has long been recognised in typewriter circles. To fill this need the Remingtons began their exceptional work on a portable machine long ago. With the usual Remington thoroughness, one by one the usual objections to small machines were overcome. The fact that new portables were being marketed one after another did not hasten the Remingtons. They were determined to build a machine which would supply all of the exacting requirements of the people for whom a typewriter of this type is intended. 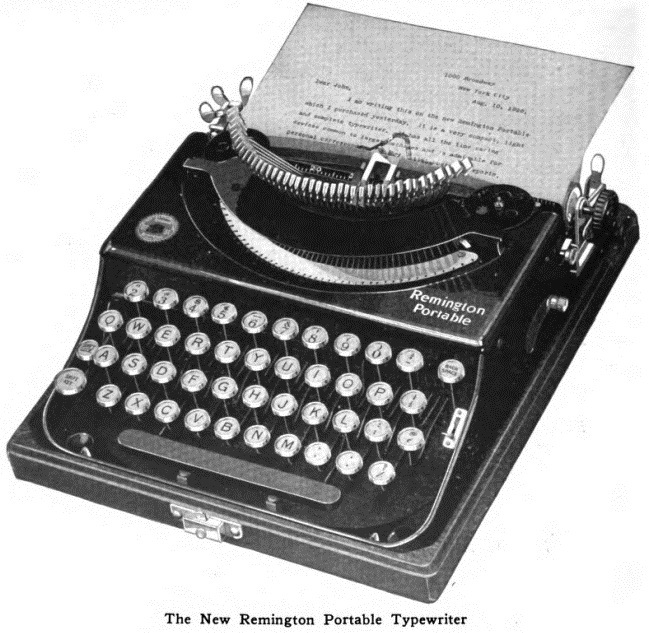 And the portable Remington is distinctive among portable machines, chiefly because of its standard keyboard” ... Remington thoroughness is maintained throughout the entire construction of the new addition to the Remington family. Strength and reliability have not been sacrificed in the effort to achieve lightness. The lightness of the machine is due to the design itself.” (My italic emphasis, not TT’s). Quite why it took Remington 11 months to finally launch the machine remains uncertain. Topics suggested it was because of the “insistent demands of the business world” and from salesmen to make standards a priority, causing congestion at plants such as Ilion and Syracuse. Was it only because a post-Revolution Russian order for Smith Premiers fell through, allowing space to make the Remington portables at Syracuse? Was it because, as Topics also claimed, Remington was in no haste and wanted to take their time in perfecting the machine before putting it on the market. This last notion, of prolonged finickiness, makes little economic sense, since a large gap pretty much remained in the portable market from the end of 1919, factoring in the slow and unsteady drip of Underwood three-banks. Perhaps Remington simply wanted to first let the Gourland enterprise come to its inevitable demise? Remington’s planning for a real portable certainly took at least four years. It was primarily designed by John Henry Barr, who, meeting the challenge of the Corona 3 head-on, first applied for a patent on the machine on August 12, 1915 (US1267356A). Barr said in his application, “One of the main objects of the invention is to produce a machine … in which a contraction of the [standard, four-bank] keyboard may be readily effected at will, in order to reduce the compass of the machine and thus facilitate packing and transporting or carrying the machine. 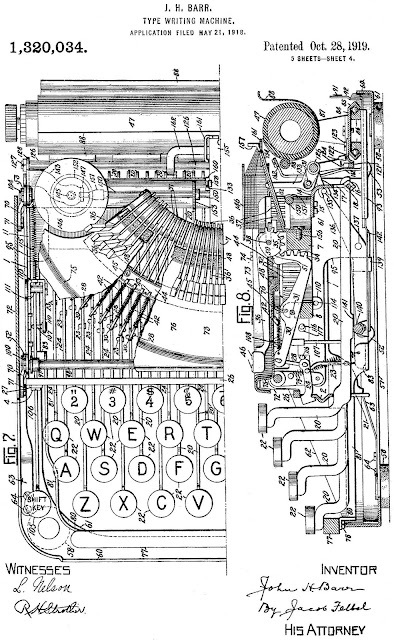 A further object of my invention is to provide a comparatively small, cheap and light yet highly efficient typewriting machine.” A patent for the final design was applied for on May 21, 1918, and issued on October 28, 1919 (US1320034A). Barr wasn’t a full-time Remington employee, but a professor of machine design and mechanical engineering at Cornell University. And before his portable reached the market, he had had plenty of staff help from experienced Remington engineers like English-born Arthur William Smith and Arthur J. Briggs. A superb outcome was always a very strong possibility. The “portable” to be discontinued was the Syracuse-made Remington Junior, which was taken off the market and replaced by a rehashed Junior, the Century No 10, in June 1919. Launched to great fanfare and very heavy nationwide advertising in July 1914, the $50 Junior was no match for the same-priced but genuinely portable Corona 3. The Century had an even shorter career, being discontinued in 1921. 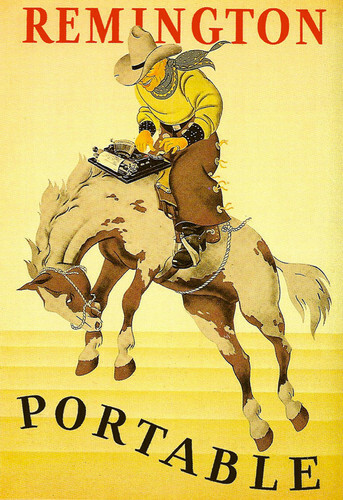 But as Richard Polt points out on his The Classic Typewriter Page Present Remington Portables, “The situation is complicated by a few Century typewriters that are essentially just Remington Juniors with a Century name decal.” Barr also chiefly designed the Junior. While clearing the decks in its former Union Trust range of factories, Remington was quite probably blindsided by a Lithuanian-born arms dealer for the Russian Revolution, and general international wheeler-dealer, Michael Jacob Gourland. In hindsight it seems to have been most opportunistic of Gourland to set up the Gourland Typewriter Corporation in February 1919 (capitalised at $2 million) and to make a widely-advertised public offering for $250,000 cumulative preferred stock in the company in mid-February 1920. The corporation said it had already contracted to manufacture 50,000 of its machines, labelled the “Baby Grand”, by the end of 1920 alone, and that production would subsequently increase. Underwood’s problems in making machines in Hartford, Connecticut, to meet the early demand for its new three-bank portable - while at the same time maintaining the rate of production of its standards - was common knowledge. The slow rate of portable manufacturing wasn’t overcome until Underwood bought the Bullard Machine Tool Company plant in Bridgeport on August 17, 1920. In the meantime, Remington’s breakthrough four-bank portable, promised for the first few weeks of 1920, had failed to appear and didn’t do so until the end of October. 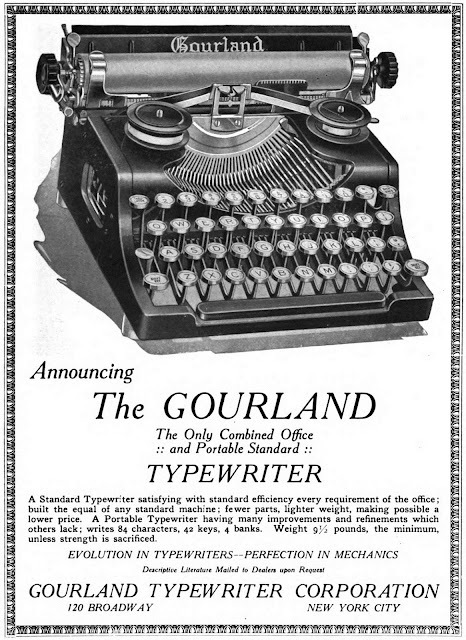 So no doubt Gourland saw a tantalising opening, evident in his spruiking the 9½lb “Baby Grand” as being “said to be the only single-shift, standard and universal keyboard portable typewriter.” Unlike a Corona it didn’t fold and unlike a Fox (and the Remington, if Gourland knew in advance what Remington was planning) it didn’t collapse. In the absence of the Remington – and faced with real competition from only the three-bank Coronas and a relatively few Underwoods - that much could at least be said to be true. The Gourland prospectus said the typewriter “will come on the market at a time when experts advise that the present demand for typewriters is far greater than the supply and they predict that the proposed output of 50,000 machines the first year could be largely oversold. Contracts for exports already entered into and the domestic demand indicate this result.” Gourland forecast a first year profit of $1 million. This was based on projected sales, but Michael Gourland planned to keep the overheads low by employing young Brooklyn girls to assemble his machines. Of course, the first year of business brought nothing like that sort of profit. 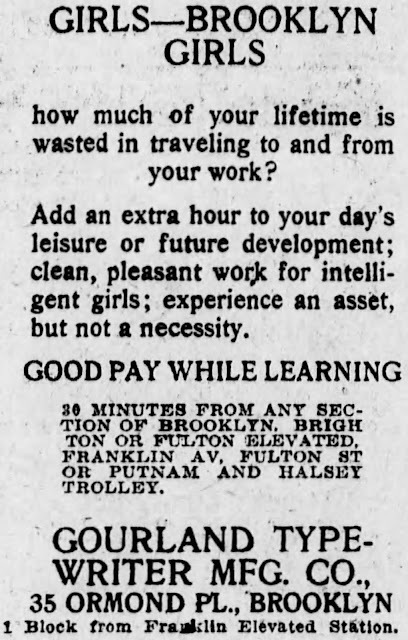 Indeed, in June Gourland was still looking for draftsmen and mechanics and by August it was in debt. 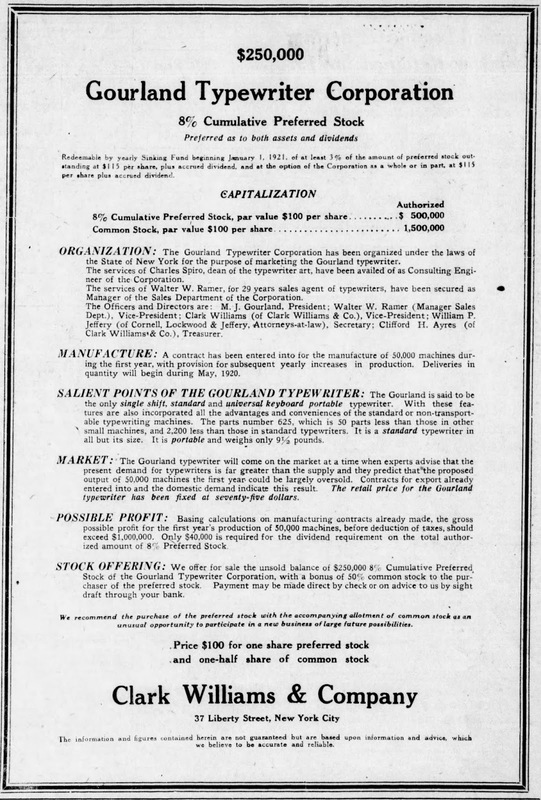 On May 24, 1921, Gourland called a stockholders meeting to consider refinancing and reorganisation. 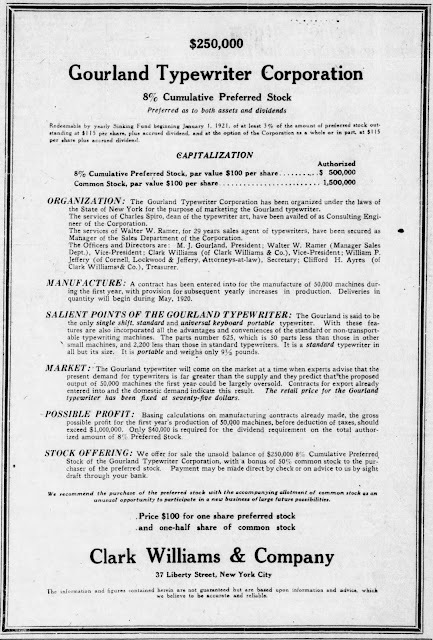 The corporation changed its name to GT in February 1922. 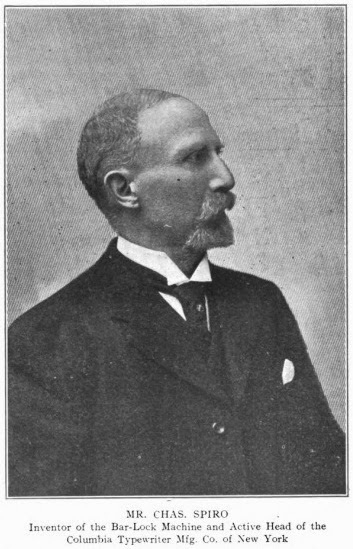 Undaunted, Gourland increased capital to $5 million in 1922, but under a new Wilmington-based board, led by stenographer Telesphore Leon Crouteau and without Michael Gourland. In truth, the Gourland typewriter-making enterprise had lasted less than two years. 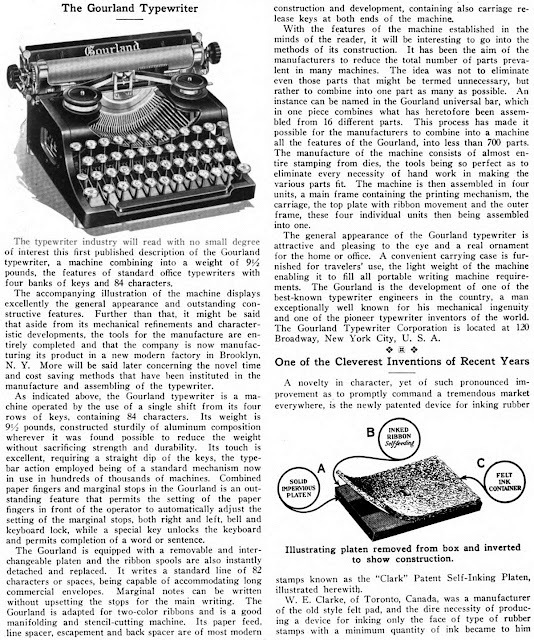 The Gourland prospectus emphasised that Charles Spiro, who it called the “dean of typewriter art”, was the consulting engineer in the design of the typewriter. “The parts number 625, which is 50 parts less than those in other small machines … It is a standard typewriter in all but its size.” The latter sentence was in turn picked by Remington. It’s most likely the Gourland was actually designed by Jesse Alexander, was a cut down version of Alexander’s Perfect and was almost certainly made in Alexander’s factory at 35 Ormond Place, Brooklyn, premises he’d acquired from furniture manufacturers the Langrock Brothers. Michael Gourland was unquestionably an opportunist. Born in Vilnius on November 24, 1879, he spent time in Britain in 1912-13 negotiating on behalf of the pre-revolution Russian Government (as well as Austria, Romania and Holland) for the rights to mechanical parts. Gourland was sent from St Petersburg to New York through Liverpool in August 1916 to buy munitions for Russian revolutionaries. He and his twin brother George, a broker, set up the Russian-American Commercial and Industrial Company to cover for their activities. Its branches were in New York, St Petersburg, Moscow, Odessa and Rybinsk. When the February Bourgeois Democratic Revolution ended after Tsar Nicholas II’s abdication, on March 16, Gourland was in Boston making absolutely certain everyone knew which side he had been on all along. After the collapse of his typewriter venture, Gourland quickly got into movies and then cosmetics. He died in New York on October 5, 1951. I recently got a Remington Portable 1 the end of November 2018, and at 96 it is still going strong. Another, curious twist involves the Mosin-Nagant rifle. The Imperial Russian military went into WWI short on rifles and shorter on production capacity. So, they contracted with Remington to produce their guns. The October Revolution ended that deal, of course. When Gourland tried to elbow into the typewriter market, I'm sure some folks at Remington took it personally. Gourland could very well have been the negotiator on the rifles, which could not be sold, domestically, and would clearly never be paid for by the Russians. And, now he wants to go into business head-to-head against Remington? Ooh, that wasn't going to end well. As always, you have dug up a wonderful wealth of sources. What a fascinating read. John Henry Barr was an Indiana native and I not only marvel at his Remington Portable design but his Barr Portable that contains all kinds of odd features! Thank you for another chapter in the Remington Portable story!